Increasingly complex, diversified portfolios coupled with ever-evolving and uncertain market conditions create the need for unprecedented levels of financial clarity and control. Generating the informed insights and strategies necessary to preserve and grow assets requires timely, accurate and comprehensive portfolio information. SEI Archway’s consolidated reporting solution transforms complex, multi-faceted portfolio data into clear, concise reporting that can be used to make critical decisions. 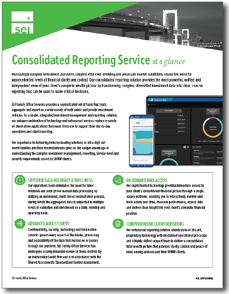 Download our Outsourced Consolidated Reporting Solution Overview to understand how SEI Archway couples industry-leading technology and unparalleled service to provide the most powerful, unified and independent view of your client’s complete wealth picture.